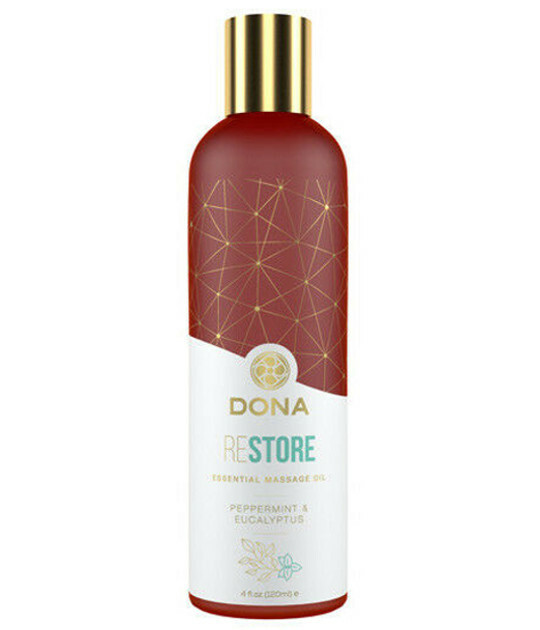 DONA Essential massage oils are carefully balanced and created by adding uplifting essential oils to a blend of natural, nourishing, and vitamin rich oils. Let the fragrant undertones fill your senses, dive deeper into your massage, and leave you feeling positive and refreshed. Made of 100 percent natural, vegan ingredients for a rich, long lasting formula. Actively moisturizes & rejuvenates the appearance of skin, with additional aromatherapy benefits from the beautiful peppermint and eucalyptus fragrance. Frequent Lover members earn 22 loyalty points on this product!